“Buying a bike is a marriage of lust and opportunity,” says ARR columnist Geoff Seddon. Find out how in the latest issue, in which we also explore the best financing options to turn your lust into opportunity. 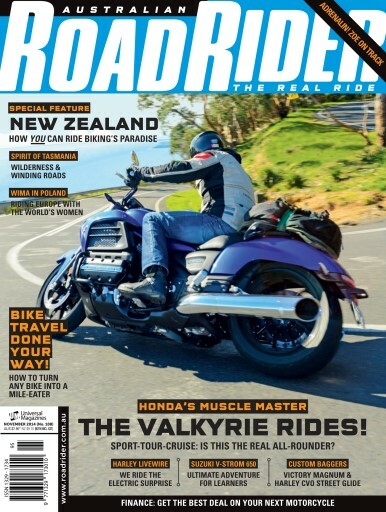 We explore New Zealand and tell you how you can get over there to ride one of the world’s biking paradises. Closer to home, we hit the best of Tasmania’s tar and dirt roads, and further afield we join the Women’s International Motorcycle Association for its annual rally — in Poland! 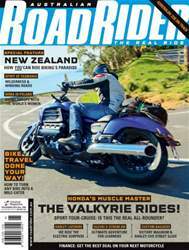 We’ve ridden some great bikes this month, too, with tests on Harley’s electric LiveWire; two blinged baggers in the form of the Victory Magnum and Harley-Davidson CVO Street Glide; Suzuki’s learner-legal V-Strom 650; and our cover model, Honda’s muscled-up six-cylinder Valkyrie.